Surpassing the previous records, National Fertilizers Limited (NFL), the leading fertilizer PSU of the country has achieved the ever highest Urea production of 38 Lakh MT with an overall capacity utilization of 118% during the year 2015-16. This accounts for 15.5% share of the total Urea production of 245 LMT made in the country during 2015-16. NFL’s contribution shall immensely help to reduce the import of Urea & further enhance food security in the country. It is remarkable that two of the Company’s plants at Nangal & Panipat, despite being vintage units i.e more than 38 years old have achieved ever highest Urea production of 5.47 LMT and 5.67 LMT with 114.2% & 110.9% capacity utilization respectively during the year. In addition to this, almost all the Units of the Company have achieved ever lowest energy consumption in 2015-16, which has helped in optimizing energy consumption in production of Urea. The Company has also recorded ever highest sale of 55,199 MT of Nitric Acid during 2015-16. During the year, the Company has taken several new initiatives. The Company has commenced the multiplication of seeds program for production and sale of quality seeds under its brand ‘Kisan’. After a gap of 20 years, Company has undertaken import of DAP and supplied it to the farmers. With the objective of providing all Agri products under one roof, NFL has undertaken trading of seeds, pesticides, Bentonite Sulphur, Diammonium Phosphate (DAP) and Bio-fertilizers. The Company is on the path of growth and has set a target to achieve the turnover of Rs. 15,000 crore with a profitability of Rs. 500 crore in the next five years. To attain these targets, the Company is exploring a number of opportunities. NFL has formed a joint venture with Engineers India Limited (EIL) and Fertilizers Corporation of India (FCIL) for setting up of new gas based urea plant at Ramagundum in the state of Telangana with a capacity of 1.27 million Tonnes per annum. The zero date of the project has been declared on 25th September 2015 and the plant is envisaged to be commissioned in 36 months from the zero date. 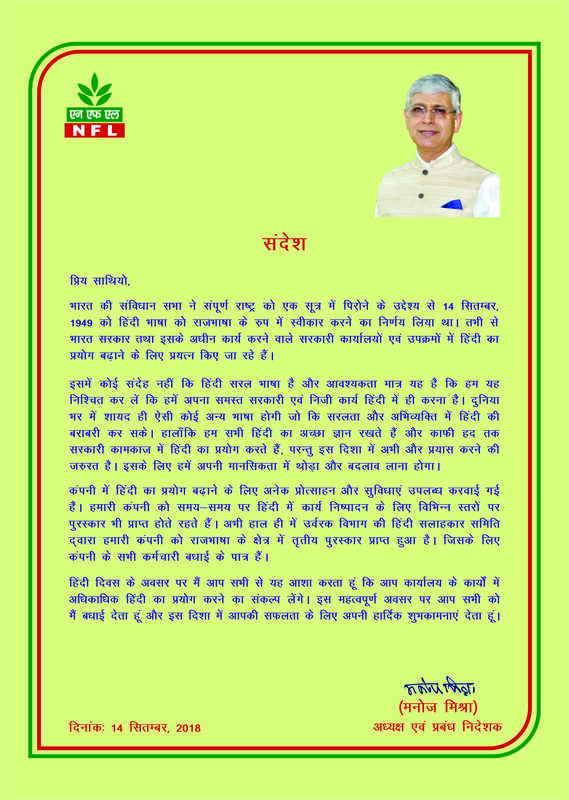 Under the Government of India initiative under Swachch Bharat Mission, NFL has entered into an agreement with South Delhi Municipal Corporation (SDMC) and Indore Municipal Corporation for marketing 100% of city compost produced from these municipalities. The Government has announced a subsidy of Rs. 1500 per tonne on City Compost to promote this organic fertilizer. On CSR front, Company carried out various projects such as construction of toilets in schools, installation of solar lights in remote areas of Uttrakhand, free soil testing campaign for farmers, distribution of Soil Health Cards and various women empowerment programmes.